Google raised a few eyebrows when it sent indie artists through Google Wallet for the new Google Music service, instead of the more seasoned Google Checkout. Well, now it’s pretty obvious why: Google sent out an email saying that Google Checkout will be absorbed into Google Wallet in 2012. According to the email, consumers don’t need to do anything while the transition is being managed. This move was a pretty obvious one for Google: Wallet is their forward-looking, NFC-enabled payment system, whereas Checkout is mostly just a competitor for PayPal in the online payment space. The move isn’t so much abandoning one product as it is combining two that have too much overlap. For a company with hundreds of active projects at a time, focus is important – and to be honest, something that’s been lacking with some of Google’s satellite products. 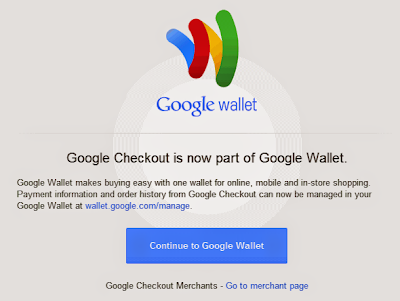 If you already use Google Checkout, the site will redirect you to wallet.google.com, where you can manage your transactions and payment methods. Google Checkout is now known as the Google Wallet Online Service, "a free service that lets you carry your wallet on the web". Not all the sellers will use the new name right away, so you'll still see Checkout's logo in many sites, anyway, Google is asking you to adjust your wording to reflect the change my early 2012, but other than that there’s no modification necessary. Easy-peasy. If you need more answers, Google is hosting a webinar on the transition – sign up for it here.